Holy crap. 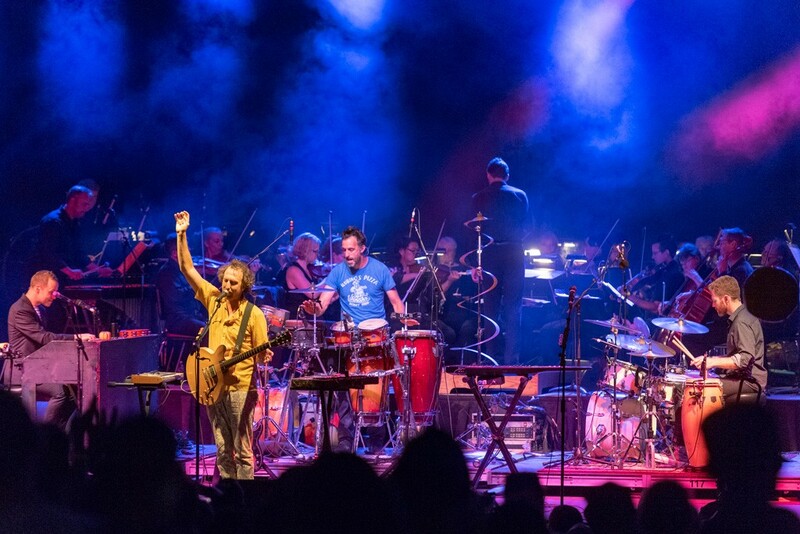 That's what I kept thinking during (and after) Guster's mind-blowing collaboration with the Vermont Symphony Orchestra on Saturday. In front of a massive audience at the Shelburne Museum, the 29-piece classical ensemble supported the seasoned rockers in one of the most outstanding Vermont performances of 2018. Under the steady hand of conductor Benjamin Klemme, music director of the Vermont Youth Orchestra Association, the two groups flowed with cohesive clarity. You'd never know that they'd had just one rehearsal prior to the show, earlier in the day on Saturday. Aside from being flooded with vivid sense memories and flashbacks to my teenage years — Guster's beloved 1999 album Lost and Gone Forever came out when I was a junior in high school — my excitement for the band's upcoming, untitled studio album was truly piqued. Guster front man and Williston resident Ryan Miller made sure to note a pair of new songs, "Mind Kontrol" and "Mister Sun" — the titles of which could change, given that we're likely still a ways off from the new album's as-yet-unknown release date. Now, I haven't heard the album versions yet, so what we heard on Saturday might not be an entirely accurate portrayal of how the songs will sound blaring out of your home stereo. But the new cuts couldn't be more different from each other in terms of tone and overall vibe. Backed with all of the heft you'd expect from an orchestra's string section, "Mind Kontrol" was a menacing maelstrom of pure, raw power. (I kept thinking of the thunderous, orchestral conclusion to the Roseland NYC Live version of Portishead's "Strangers.") "Mister Sun," on the other hand, sounded almost like it could have been lifted from a children's TV show with its twinkling glockenspiel and bright horns. While we don't know when we'll hear the final versions of these early singles, Miller confirmed via email that we should expect a ton of content to be released between now and the new record's release. As VSO executive director Ben Cadwallader told us in last week's Soundbites, we can anticipate more crossover events in the future. You'd be wise to check out the next one — whatever it may be. Guster head off on a Midwest/East Coast tour this week, culminating with On the Ocean, their weekend fest in Portland, Maine, Friday through Sunday, August 3 through 5. Between rotating bands and DJs — not to mention foodstuffs literally by the truckload — ArtsRiot's weekly Truck Stop is already a feast for the senses. 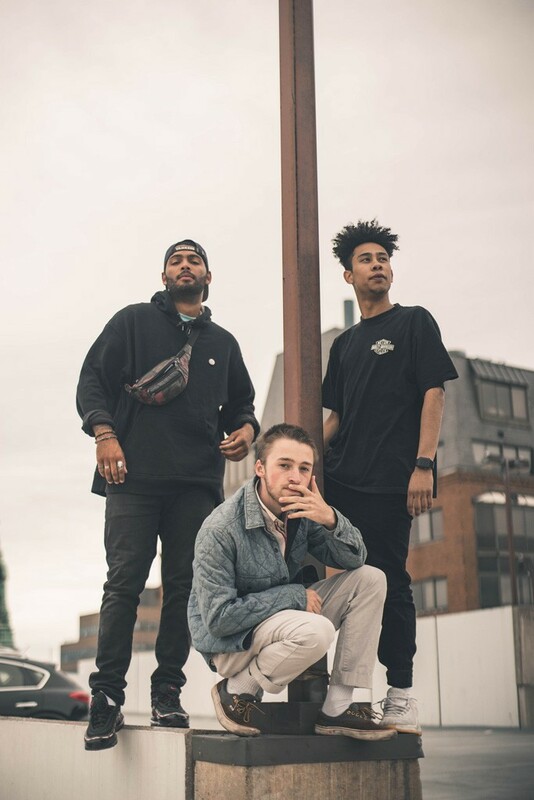 But for this week's edition on Friday, July 27, Burlington hip-hop and lifestyle collective 99 Neighbors transform the venue's performance space into a veritable show-and-tell of everything the crew has been working on for the last year. Called Open House, the loosely structured presentation culminates later in the evening with a group performance. "It's a collection of all of the things that we're working towards," rapper Hanknative, aka Hank Collins, tells Seven Days. "That's clothing, that's music, that's graphic design-oriented [work]." We can expect video projections, paintings and specialty clothing to be in the mix. During the past year or so, a nebulous horde of MCs, producers, fashion designers, photographers, videographers and other artists has snowballed into what's now known as 99 Neighbors. MCs Hanknative and Sam (Paulino) and producer Somba are the most visible members. Formerly known as Possibly Human, the outfit made a strong impression in 2017 with Sam and Somba's divine The South Cove EP. After wading through growing pains and a mild identity crisis, they're just now unveiling what they've grown into over the past 12 months. "We, as musicians, kind of had no identity," says Somba, real name Caleb Hoh. He refers to the somewhat piecemeal string of singles and videos the collective uploaded to the web over the last year. "[We] just stopped wanting to say, 'Hi, we're possibly.' We know we're human, and I don't like saying, 'I'm possibly.'" "It was a working title," adds Collins. The new name, 99 Neighbors, derives directly from the pack's creative experience. "It's a by-product of our lifestyle," says Hoh. "We were living in one of the most jenk apartments I've ever seen." "It was a trap," says Collins. "It eventually invigorated this micro-scene," says Hoh. "Next thing we know, all of these artists were coming through, making music and painting there." On the horizon, Hanknative's first "cohesive body of work," tentatively titled Problem Child, should be released at some point in the not-too-distant future. You're likely to hear a preview during Friday's performance. You have not been to enough festivals yet this summer. Don't try to argue. Don't give me excuses. In two days, just pack up your car and head down to Thetford for Thetfest. Over Friday and Saturday, July 27 and 28, tons of kickass artists — many of them VT-based — rock the Upper Valley shindig. The eclectic lineup should please a wide range of tastes: jam staples Swimmer, indie darlings J Bengoy and avant-garde auteur Greg Davis, among others, are on board — not to mention Animal Collective founding member Deakin. Also of note is Montréal-based ambient composer Kara-Lis Coverdale, who was scheduled to perform in Burlington last year as part of Davis'/Soundtoys' Signals Series. Coverdale unfortunately had to cancel for visa-related issues. Those hoping to get an earful of her celestial compositions last summer should take note of this second chance. In addition to curating the festival, the folks at Windsor-based recording co-op What Doth Life seek submissions for a new compilation. "Got a song? Send it along. We don't discriminate," reads a post on WDL's website. With criteria as scant as that, I don't see any good reason why any music-makers reading this shouldn't proffer a track. WDL's last comp, 2016's Hot Garbage & Sunscreen, leans heavily toward alternative (and really alternative) rock sounds — but no genres are specified in the submission guidelines for the new collection. The submission period ends August 15. Visit whatdothlife.com for more info. Chaos Chaos, "Do You Feel It?" Amber Mark, "Love Me Right"
Martin Carr, "The Main Man"
Kimbra, "Top of the World (Featuring Snoop Dogg)"
Correction, July 26, 2018: An earlier version of this story included an incomplete description of Benjamin Klemme's job.